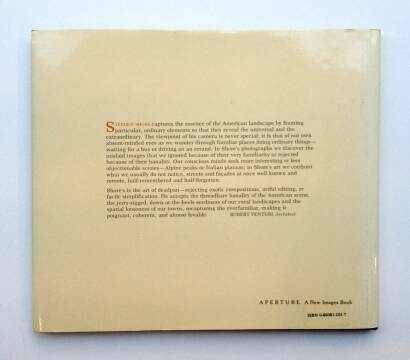 Comments: Hardcover under illustrated dust jacket, 255 x 295 mm. First edition, 1982. Text in english. Little wear on dust jacket. Touch of fading to the spine. Fresh copy. In very good condition. Included in The Photobook by Parr & Badger, vol.2, p. 35. 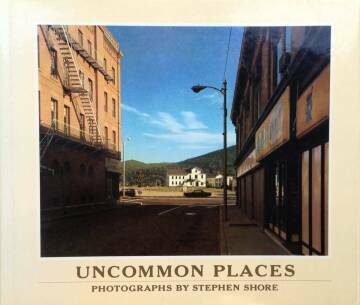 Copy signed by Stephen Shore. One of the most important and most influential books with colour photography ever ! Rare. 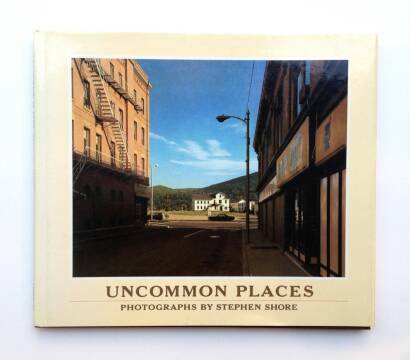 Published by Aperture in 1982 and long unavailable, Stephen Shore's legendary Uncommon Places has influenced a generation of photographers. Among the first artists to take color beyond advertising and fashion photography, Shore's large-format color work on the American vernacular landscape stands at the root of what has become a vital photographic tradition. Like Robert Frank and Walker Evans before him, Shore discovered a hitherto unarticulated version of America via highway and camera. Approaching his subjects with cool objectivity, Shore's images retain precise internal systems of gestures in composition and light through which the objects before his lens assume both an archetypal aura and an ambiguously personal importance. In contrast to Shore's signature landscapes with which Uncommon Places is often associated, this expanded survey reveals equally remarkable collections of interiors and portraits.